Keeping track of food safety compliance is one of the most difficult tasks in our industry. It can be a constant headache to make sure all of your employees have current food safety training and certification. One of our best headache-saving features that we offer to our clients is the free reporting tool! You can access the tool easily by logging into your StateFoodSafety account, entering your dashboard, and clicking Reporting. We understand our clients have a variety of needs, so we focus on three different aspects of reporting to make it as versatile as possible for each client. We record expiration dates, course progress, quiz scores, test scores, overall seat time per student, course language, local regulatory authority, and more in real time. Our reporting tool takes all of this data and puts it together in an easy-to-read report so you can see at a glance any other information you need to manage your company’s food safety training compliance. You choose which pieces of information you want on your reports and which ones you don’t. Need to see expiration dates but don’t need to know course languages? That’s easy to adjust! Our reports can collect custom information, such as unique employee ID numbers or the location where employees work. If you don’t already have custom fields, we can set them up for you at no additional cost. If you have multiple locations and would like to see reports for a specific store, you can! 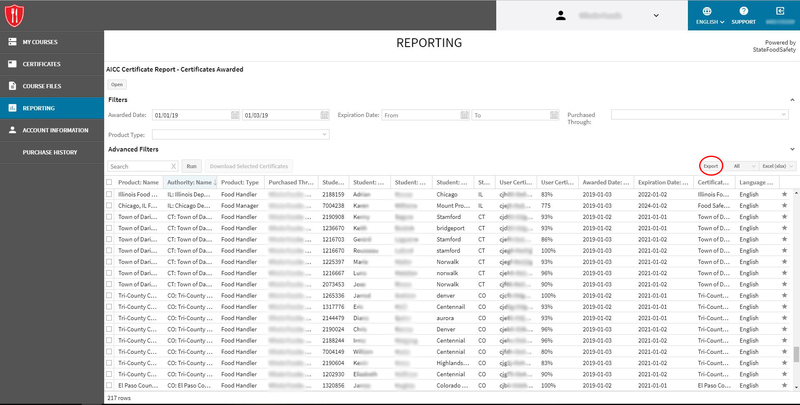 Drill down your data with individual store-level reports, look at the big picture with a report that includes your entire company, or anything in between. Once we have reporting set up and customized to meet your needs, running reports is easy! Even better, the data can be exported as an Excel or CSV file, giving you complete control of your data. Your job can be hard—we get it! But as you unwrap the new year, we invite you to try our reporting tool. See how much time and effort you can save by using our built-in tools! Reach out to your dedicated StateFoodSafety account manager or contact our customer support team for more information.